The Ijmuiden plant is the only integrated steel mill in the Netherlands. It was built in 1920 and named Koninklijke Nederlandsche Hoogovens en Staalfabrieken .In between 1924 and 1926 two blast furnaces, a coking plant and a power station were brought into service. 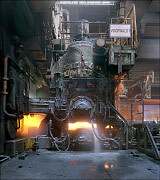 From 1939 on steel was produced in open hearth furnaces. In 1958 the first BOF shop was built and two blast furnaces were added. A second BOF shop opened up in 1968.The hot strip mill was commisioned in 1969. From 1980 on a continuous caster was in use. 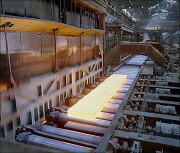 In 1999 Hoogovens merged with British Steel to form Corus Steel. Tata Steel from India took over Corus in 2007. Today the mill runs two blast furnaces (built in 1967 and 1972), two coking plants,One BOF melt shop,a continuous caster and a hot strip mill.